Antero CMMS - Maintenance Data Management Software | AllMax Software, Inc.
Get equipment and asset tracking, work order management, meaningful reports and more with Antero Computerized Maintenance Management Software. Maintenance managers have shared with us that one of their primary concerns is always “making sure that the work got done.” With Antero, not only can you schedule preventive maintenance tasks to create your work orders, but you can also track when the work is completed. This includes detailed information on when the work was scheduled, when it was completed, labor, parts and more. Whether you have a maintenance staff of one or many, work planning and work order management can quickly become a big hassle. The Antero Dashboard is your home base to review your open work orders, forecast upcoming work and more. On a Work Order Calendar Page, all open work orders are displayed. From here you can see the status of the work order, or even rearrange them. Use filter options to find work assigned to a specific person or piece of equipment. The Work Forecast Calendar lets you plan the work that is coming up in the future. Allowing you to adjust workload to meet your needs. Container Pages let you define links to external websites and resources. Set up containers to display meter or gauge style indicators that give insight into information you want to see. 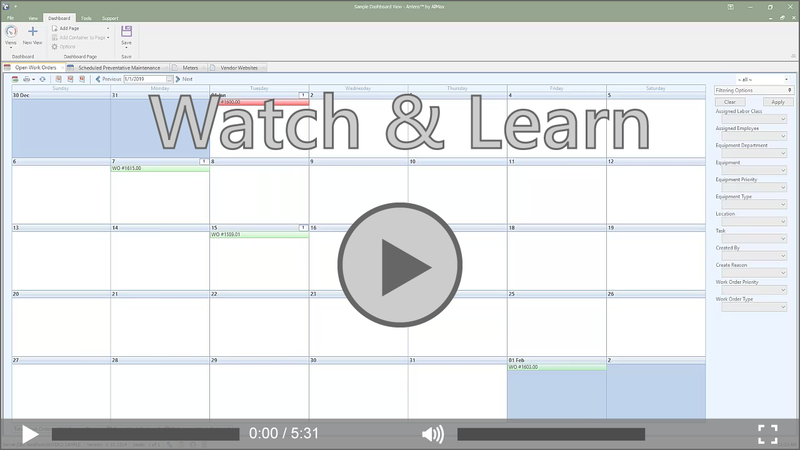 - Open Work Order Calendar provides quick view of open work orders. - Review upcoming work on the Forecast Work Order Calendar. - Container Pages can be customized to provide visual display of specific data or links to external locations. Flexibility is the name of the game when it comes to work order creation in Antero! Create Work Order Templates for all your routine preventive maintenance tasks for automatic generation based on ‘last completed’ information. Have an emergency or corrective repair come up? 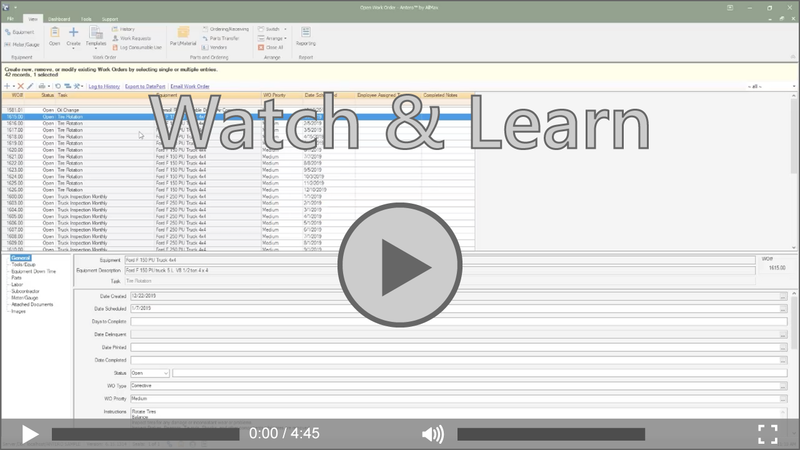 Quickly create a one-time work order. The Open Work Order section in Antero is a power-house where your entire maintenance team can come to see current work that needs to be done. Or, if you’d rather, work orders can be printed or emailed to personnel. Enter information pertaining to equipment down time, parts & labor, meter and gauge readings and anything else related to the completion of the work, then log the work order to history, creating a historical record and confidence that the work got done. - Open work order section is your home for daily use of Antero. - Easily add corrective work orders as needed. - Provide comprehensive completion details on each work order before logging it complete. Tracking equipment and assets is a core part of any maintenance program. With Antero, the Equipment section allows you to create comprehensive records on all your equipment. Enter as much detail as you need, including description and model, original value, vendor and warranty information and more. 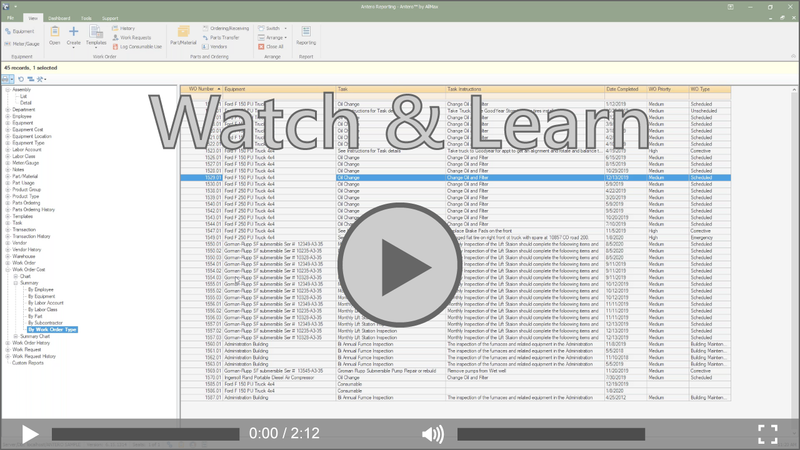 Review work order templates that have been created for a piece of equipment, currently open work orders, maintenance history, in-service history and more. - Create a comprehensive list of all your equipment and assets, including as much detail as you need. - See which work order templates are assigned to each piece of equipment, to ensure nothing gets missed. - Review currently open work orders and a record of maintenance history. Antero includes over 100 built-in stock reports. Drill down to gain a better understanding of your maintenance program. 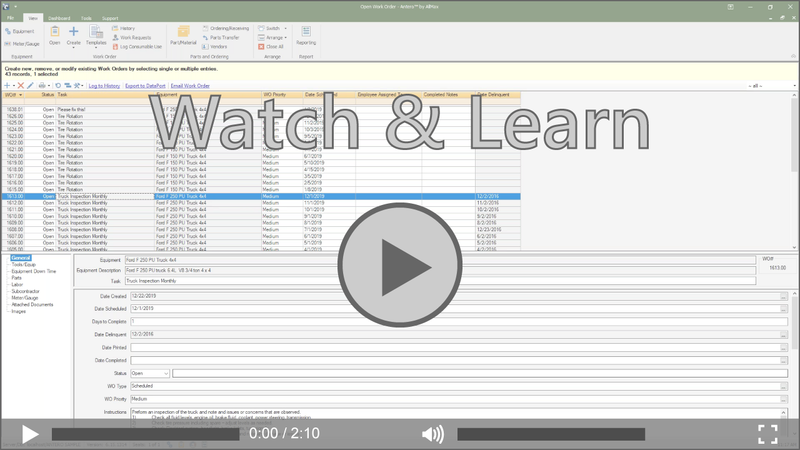 While Antero features popular usage and cost reports, others are available as well, including employee and labor, parts usage, vendors and ordering and a variety of reports related to work orders. Custom reports are also available as a service through our technical support department. 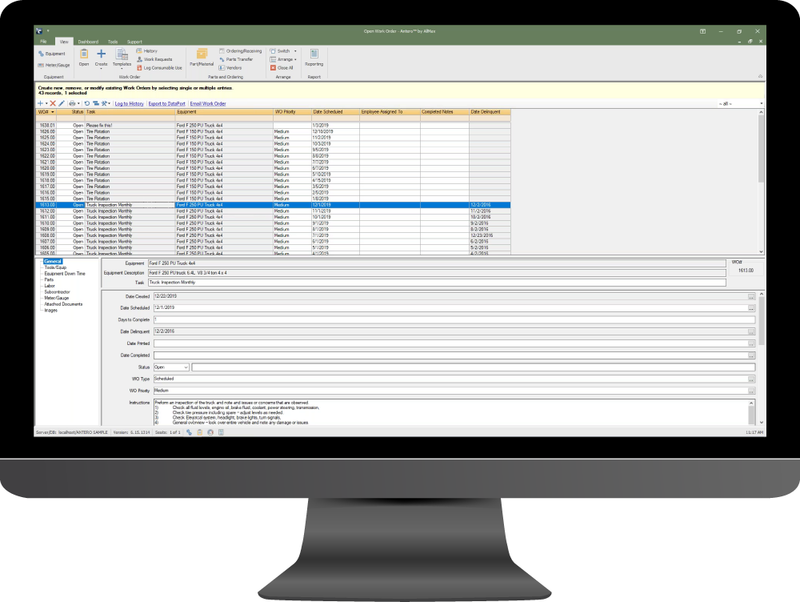 - Antero offers over 100 built-in stock reports to let you see the most critical information about your maintenance program. - Reports are available on critical aspects of your operation. - Custom reports can be developed by our technical support department. Want to learn more about Antero CMMS?